Cheers to a Gorgeous Life! 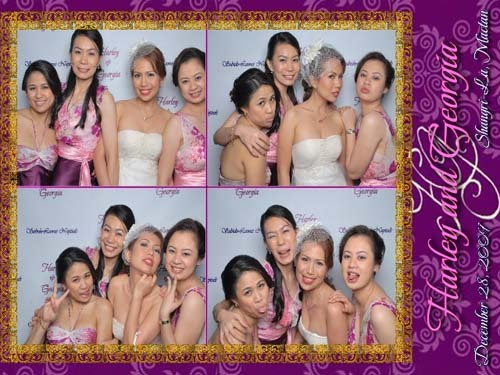 : A Photobooth Is A Sure Winner! It was a very good call we hired Partypics photobooth during our wedding reception. Since Filipinos just love having their photos taken, it was selling like hotcakes. Oh boy, our guests totally loved it! I could notice them queuing not just once at the Partypics corner. And they treasure the pictures. I even suspect they treasure it more than our official souvenirs because when we visited our relatives’ homes days after the wedding we could see their Partypics photos proudly displayed in the living room. Some friends immediately uploaded and used theirs as Facebook profile photo. 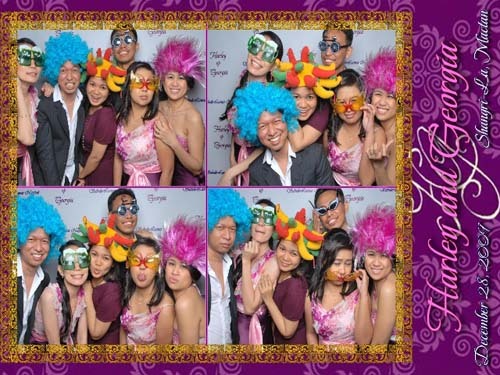 We were so happy with the service of Partypics. Unusual sunglasses, wigs, mascaras were provided so guests could goof around with them in front of the camera. After the 2-hour of service they immediately gave us the CD containing all the photobooth pictures, which we really appreciate because we revelled in viewing them the day after. We were delighted to see proofs that our guests had a great time. They also gave us the tarpaulin, which was used again during the 2nd celebration organized by hubby’s father in their hometown. We must the happiest couple on earth that day! It's more beautiful because my gorgeous girlfriends were there to celebrate with us. It's been almost a decade since we graduated from the university. Everyone looked more fab!